Lots of questions from a newbie. GIMP Forums / GIMP / Beginners / Lots of questions from a newbie. If I want an image copied from another source to be placed EXACTLY the center of the current image, for elegance and consistency, instead of doing with a mouse and looking at the coordinates (which I think it is stupid and will not be precise), what is the wiser method to do so? I want to ' select ' something rectangular and copy it, however, the area of selection has to be fixed at all times. For example, 1000x1000, Again, Id on't want to use a mouse to make this 1000x1000 because you know, it would be 999x1000 or 1000x1001. It's hard to be precise unless a lot of eyesight and energy is spent. Is there any wiser way? like entering the number 1000 and 1000 and then it automatically draws me the selection I want?
. Is there any method that I can enter the value or just press a few button to make a nice professional result?? 4. Ok, if now I've got a new file with a clean white background. I am going to put some text on it. You know, the text box appears as I click on the mouse, the text starts there. After putting the text, for elegance and professional reason, I 'd like to make the whole text be located at the center of mass of the whole image. How to make this? I think I will have more questions and I will put the questions here thank you. RE: Lots of questions from a newbie. this is another question but I don't wan to start a new thread because i've started too many threads today. (Sep 24, 2014 21:40)ofnuts Wrote: If it's all the same color then select by color and the fuzzy select could do the trick (I usually don't recommend them, but since we are talking bout rectangles, there are no anti-aliasing pixels on the edges). Be careful about what you consider to be "obvious rectangles". 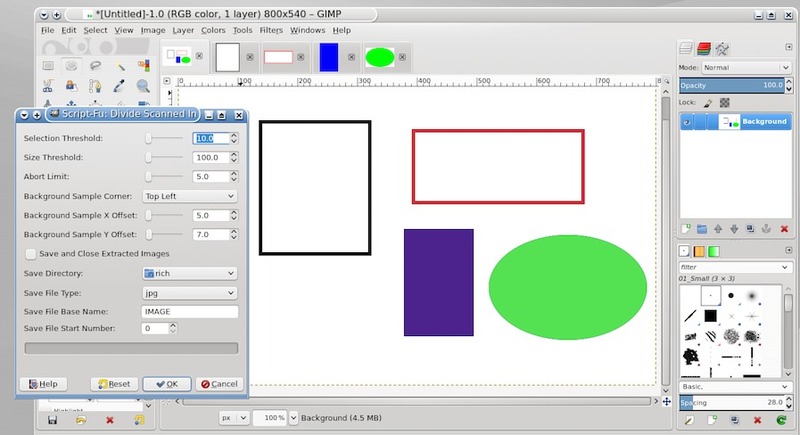 I actually experienced such wonderful feature in SnagIT before, but I can't figure out how to do it again in SnagIt. Do you know that? but stopping short of writing the selections to new images. 1. how to detect (automatically) the rectangular area and select it ? it will be more easy and precise at the boundaries.